Tran Thi Thu Thuy, 42, is a member of Heifer Vietnam’s project, Improving Livelihoods in the Poorest District in Tra Vinh Province through Values-based Holistic Community Development. She lives with her husband, Nguyen Van Thuong, 44; her son, Nguyen Trong Hoang Nguyen, 22; and her daughter, Nguyen Ngoc Kim Nguyen, 7, who has Down’s syndrome. Thuy was born in Vung Liem district, Vinh Long Province. After her father died, her mother and she moved to Cang Long District, Tra Vinh Province. She was sent her to school until she was in grade 9 and left due to sickness while her mother ran a fruit business. After leaving school, she learned sewing from a female cousin to learn sewing in Cang Long. One day, she and her cousin visited a close girlfriend of her cousin, whose brother later became Thuy's husband. They were given 800 square meters of land by her mother for a home. Her family had more burden when she gave birth to Nguyen Ngoc Kim Nguyen with Down syndrome. She had to spend most time taking care of her and taking her to the hospital for treatment, with little time for sewing. Her husband's income from labor was not sufficient for her family’s daily expenses. They just had two meals per day with egg and sometimes fish or meat, which made her often have low blood pressure. In 2011, she registered to join Heifer project. As a member of the project, she received one heifer, grass for planting, $50 for building an animal shed, non-technical and technical skills trainings, which she believed would better her family lives. Being skillful at sewing, she asked the project to give her group members a loan to buy 11 sewing machines and one overcasting machine so that she could teach them free of charge how to sew for daily income generation. Now all but three have repaid the loans, and she earns $2.5 per day through their sewing clothes.In addition, she taught 40 other local women free of charge to sew clothes for working at garment companies. After the courses, most of them could find sewing jobs and some work at home as seamstresses. Thuy borrowed three loans of $100 per time from her group's savings. The first loan was invested in tilling the land for planting orange trees and raising 30 hens, which brought her a profit of $110 a year. The second loan was used to reinvest in raising 200 chickens, which later died all due to bird flu outbreak. And she invested the third loan in buying fabric, creating a profit of $150. She hopes to have the fourth loan to reinvest in buy fabric for more income. At present, her family is much better since her son who is grown-up and works as a waiter at coffee shop sends her family $90 a month, and her husband who works as a mason earns $120 every month while she can make $752.5 per month. Since her daughter is grown-up, she spends less time caring for her. She has replaced their former thatched roof with an iron one, bought furniture for her house, accessed tap-water instead of using river and rain water, and she has one pregnant cow after passing on the gifts to another family. Her orange trees which are fertilized with cow manure will bear fruits in a year. Her family takes three meals per day with more nutritious food like fish or meat, tiny shrimp, vegetables. 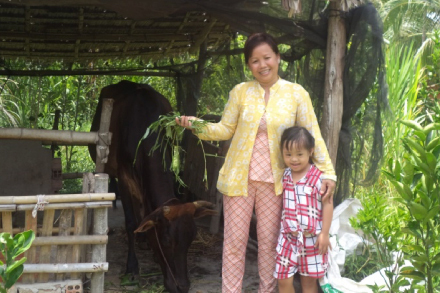 She said, “thanks to Heifer project, I could improve myself and my husband spends more time doing housework and taking good care of the cow and takes more interest in me. The monthly group meeting is held at my house where I welcome all of group members, and I can share my sewing skill, experience and animal husbandry with them. I like 12 Cornerstones, especially Sharing and Caring, and I am happy to see those whom I teach sewing can earn income by themselves.” Thinking of the future, she hopes to build a new house, have her son get married and expand her cow herd.